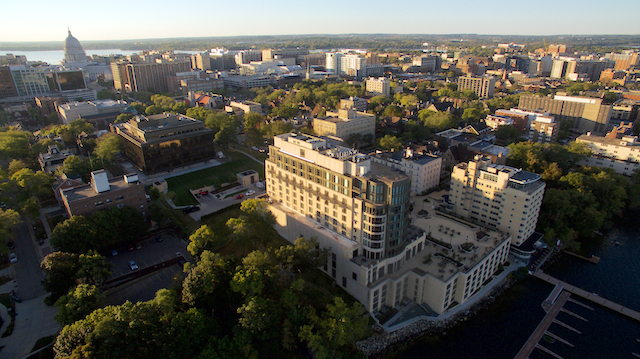 Residents of Madison's Mansion Hill neighborhood remain concerned over noise disruptions following last week's approval of an entertainment license for the Edgewater Hotel. The City of Madison Common Council approved the license on Tuesday, October 3rd, following an application process that lasted several months. The license allows the Edgewater to hold 35 outdoor public events each year, limiting the permissible noise level to 70 decibels. The Edgewater earned Council approval for an entertainment license in 2014, according to city officials, but failed to pay the $300 licensing fee. The revelation this summer that the hotel lacked the proper licensing for events such as amplified outdoor music put a stop to their summer programming, which has drawn numerous noise complaints from the Edgewater's neighbors. Alder Ledell Zellers, whose Second District includes the Edgewater, says she has been receiving these complaints for years. Zellers proposed amendments to the entertainment license to limit the frequency of events during summer evenings, but the Council denied her proposal. Despite this and the complaints of her constituents, Zellers sees a way for the Edgewater to hold a license and coexist with its neighbors. “I think that the neighbors in general are not against them having an entertainment license. The problem is just the number of outdoor events and the volume of those events," Zellers said. 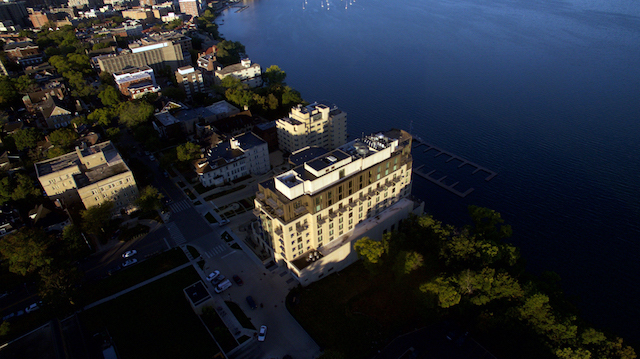 The Edgewater is one of many venues in Madison to hold an entertainment license, Zellers said, but one of very few licensees situated in a residential neighborhood. The volume and duration of concerts at the Edgewater make them unpopular with some neighbors, particularly those renting apartments at 2 Langdon Street and the Kennedy Manor Apartments. Carol Poore has lived in the area for 20 years, and wrote to the Alcohol License Review Commission to oppose the Edgewater's licensure. "The Edgewater Hotel has turned out to be the worst neighbor imaginable since the hotel began playing ear-splitting amplified music outdoors on its plaza a few years ago," Poore wrote. "On beautiful days when I would like to have my windows open, I am forced to close them and turn on the air conditioner to try (unsuccessfully) to block out the noise." Zellers said the worst area of noise pollution is a block and a half zone extending toward the capitol from the hotel. For some neighbors, the noise is blocked by buildings – but for those without this protection, outdoor concerts at the Edgewater can be a constant source of stress. In memos submitted to the Alcohol License Review Commission, Mansion Hill residents describe moving their bedrooms, wearing headphones and leaving their apartments to escape the noise, which they say often continues late into the night. Lani Schuster lives in the Kennedy Manor Apartments facing away from the Edgewater, but still finds the Edgewater's events to be a frequent disruption. "When the series of concerts that use amplified music began,” Schuster wrote, “I had to begin shutting my windows during the day and at night. I no longer can take a midday nap if a band is playing or stick to my 9pm bedtime schedule, when events go past 9pm, which they often do." Despite numerous grievances, some Mansion Hill residents are still strong supporters of the Edgewater. A number of the hotel's entertainment license events are open to the public – neighbors see their summertime outdoor movie screenings and wintertime open rink events as a positive contribution to the community. Judy Karofsky has been a Mansion Hill resident for 25 years, and supports the Edgewater's licensure. "Beyond the benefits of a major investment in public infrastructure, The Edgewater added a new, joyful quality of life to my neighborhood that did not exist before," Karofsky wrote. "In my experience, they are certainly not more disruptive than the cars, sirens, skateboards, motorcycles, buses, parades, and other distractions of an active downtown environment." The hotel's licensure will expire at the end of the year, and must be renewed for 2018. If the long-problematic outdoor events continue to be an issue for residents, the license may be revoked in future years.